The grand vision of an Indian businessman is being matched by the grand vision of an Irish architect in a city one hour’s drive north of Chandigarh. Chandigarh, of course, is a city that was itself the grand vision of arch-modernist Le Corbusier. Now McCullough Mulvin Architects, which has more than a modicum of modernism running through its veins, is the practice making businessman Gautam Thapar’s vision a reality, with some aplomb. The subject of all this attention is Thapar Institute of Engineering & Technology, in Patiala, in the far north-west of India. Opened in 1956, less than a decade after Partition, it was — and still is — the concern of the Thapar family, a family of industrialists and philanthropists. In the inimitable way India has with English, the Institute is described officially as ‘Deemed to be University’, and that kind of describes it quite well: it kind of is, but not one you’d really remark upon — until now. Scattered across 102ha of land in this, the Punjab’s fourth largest city, are various non-descript, blocky, painted buildings, making up the university. The vast majority of them are so lacking in personality or even recognisable features that the executive architect (Design Plus Associates, from Delhi) showing me around wouldn’t even hazard a guess at when most of them were built. But a sea change is afoot. Although the project only began in principle in 2015, already some very large, very modern buildings have been completed on the site and a new heart for the campus — the Learning Centre — is nearing completion. These new structures integrate classical and more modern Indian traditions and architecture, from the Mughals to BV Doshi, with a 21st-century European sensibility, on quite a monumental scale compared to what is already there. It’s hard to convey just how different this is from what is extant. This is revolution, not evolution — and you get the feeling that this is exactly what Rajeev Vederah, chair of the Board of Governors of the University and charged with delivering the vision, wants. A former Thapar student himself, he forged a career in India’s paper industry with the Thapar family. When asked to take on the Institute/ Deemed to be University as chair of the board of directors, he approached it as a business venture, reviewing everything from the teaching models and staffing to the standard of research and the very size and shape of the institution, commissioning new buildings that will not just announce its presence to the rest of India, but shout for 21st-century attention. McCullough Mulvin was specifically asked for an ‘iconic’ building, but is delivering something much more than that, though it will certainly be attention-grabbing when complete. While, as mentioned, there’s a history of European architectural intervention just down the road in Chandigarh, what exactly is a practice from Dublin doing creating buildings in the Punjab, and not only that — its first building in India? The geography is important. As part of Vederah’s push for a more national presence and international profile, he has also forged links with universities outside of India including, importantly, Trinity College Dublin. McCullough Mulvin just so happens to have worked for that august educational institution and so came under positive scrutiny. So, as well as a new heart, McCullough Mulvin has given the Institute a new spine, unifying the campus along a central route that starts at one end with a visitors’ centre, accessed from a new entrance, widens out as it moves along through the Learning Centre core, thins down again and ends at dramatic new accommodation blocks. 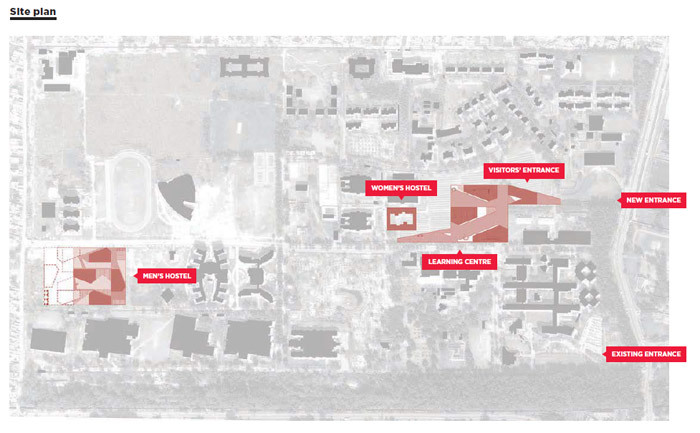 Plans for the next phase include more accommodation, a venture lab and sports centre. Both of these paths have access to all the facilities of the Learning Centre, plugged into the centre of the walkway, which include a library, 18 lecture theatres (of 150–450 seats — the two largest theatres suspended in the space) and a computer sciences building. A dramatic concrete spiral staircase links the levels in the middle. In fact, the whole undercroft’s materiality is exposed concrete, which changes to red stone — synonymous with northern India and its forts — at the podium level. 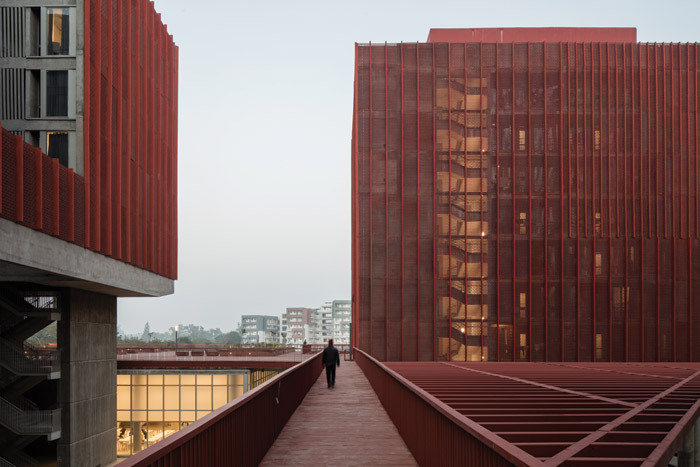 The buildings themselves carry the red materiality down to the ground, as does the exterior walkway cladding. It’s a piece of considered, European, brutal minimalism tempered by a Mughal tradition. This podium motif and relationship of materials is continued in the new men’s hostel accommodation a little way on from the end of the central walkway and Learning Centre. Interestingly, the whole project is being self-funded rather than through bank loans. The eventual plan is to create a university of 15,000 students, from a base of around 4,500. Increasing the student numbers increases fees coming in and these are being used for the phased development. This is why the first buildings to be completed have been the large new accommodation blocks. 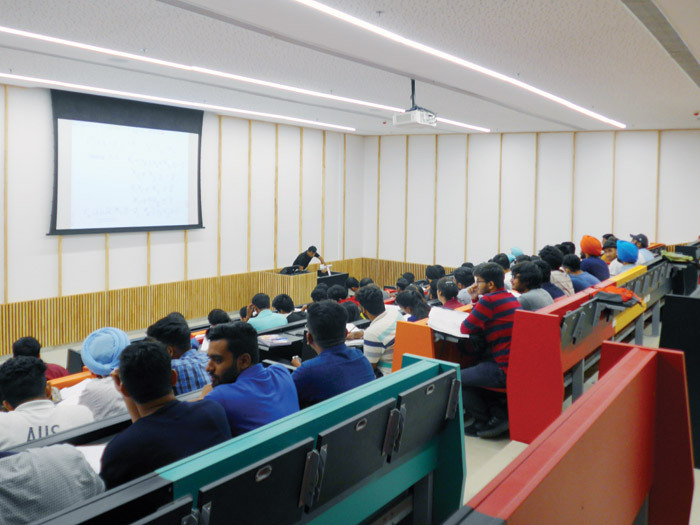 The first was for 400 women — student accommodation is segregated in India — in a quadrant building at the end of the central walkway just beyond the Learning Centre. For the men, McCullough Mulvin has completed four of a planned seven blocks currently housing 1,140 men and that, when complete, will eventually house 2,000. These lie at the end of the new central spine. The men’s accommodation blocks sit together in a complex. 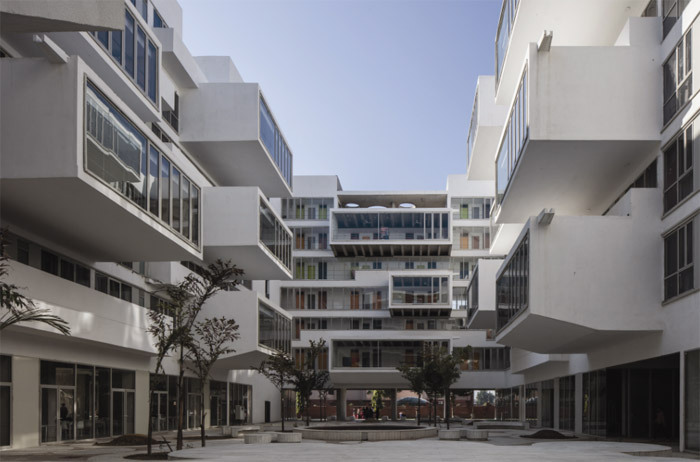 The ground level is all about porosity with large communal areas — again including a water feature. 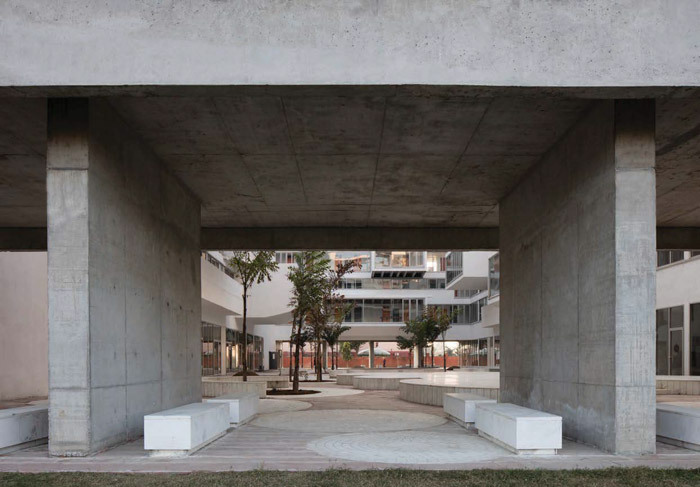 Exposed concrete rises from ground level, including the large pilotis. Here also, everything turns red at podium height — from giant steel beams criss-crossing the space to another walkway around the buildings. This level too has its community spaces, including large square tables for playing chess. In fact, Mulvin describes the towers themselves as being something like chess pieces when viewed from above. 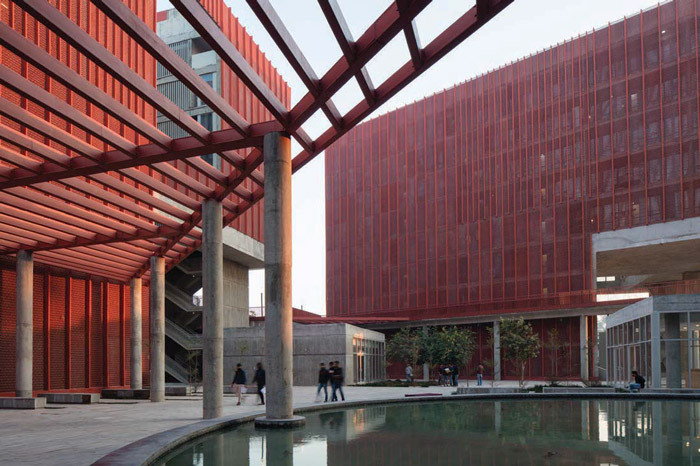 Each of the blocks is clad with red perforated screens — a direct reference to the traditional Indian hand-carved jali screens whose geometric patterns allow air and dappled light through. Hand-carved marble or other stone would have been prohibitively expensive, so McCullough Mulvin’s answer was to create them from coloured, glass-reinforced concrete. These giant screens surround the buildings with occasional Corbusier-like vista views punched through. 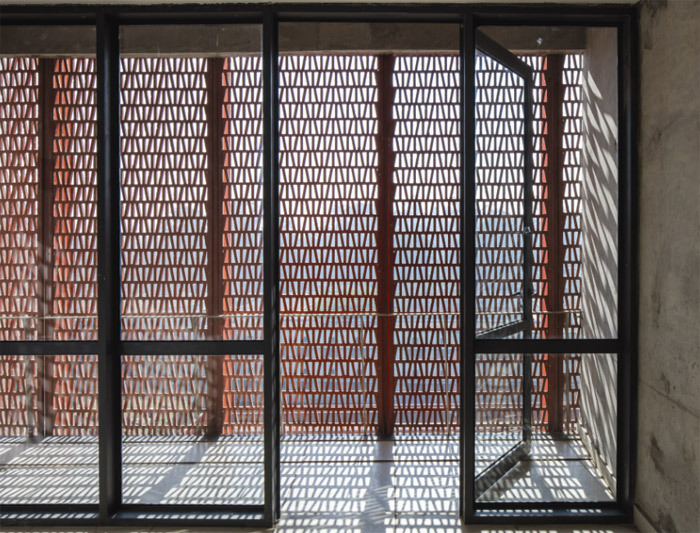 The women’s block similarly uses these GRC jali screens on the outside of the building, this time in silver grey. Here, McCullough Mulvin has created an inward-looking cube. 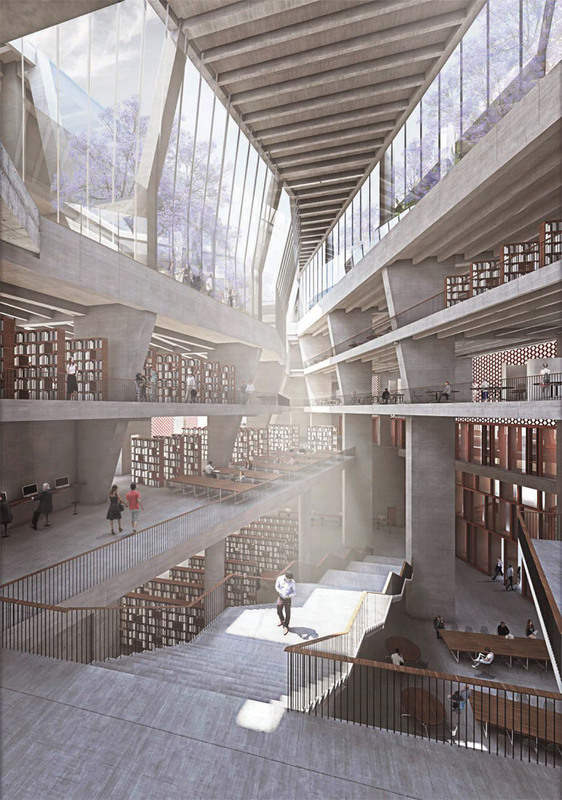 Enter through one of two sides open at ground level and you are in a water and marble garden, the inner facade articulated by cantilevered boxes protruding into the space at various intervals. 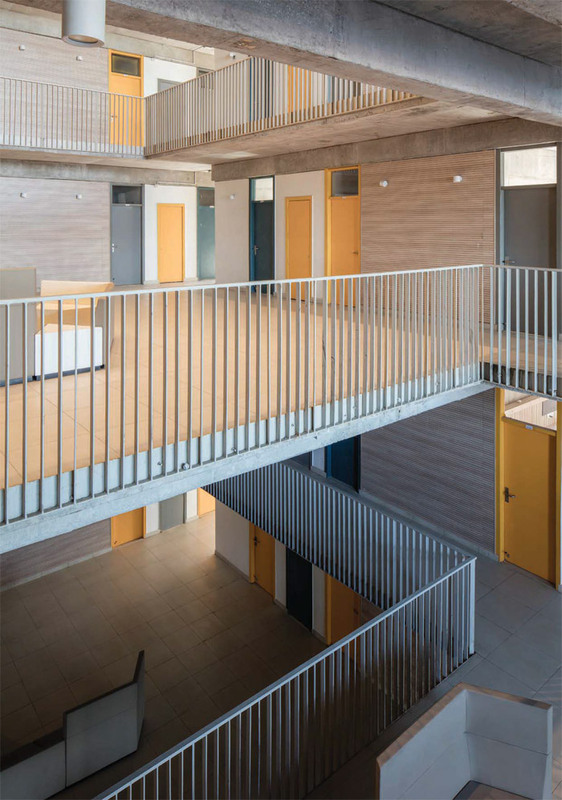 Both the men’s and women’s blocks follow a similar pattern of single rooms with a shared bathroom facility between, or shared rooms for two with their own bathroom. Looking inside these accommodation blocks, you suddenly find yourself confronted by a building that, though new, looks as though it has had rough treatment for a number of years. There are a few factors at play here: one, the level of finishing has not been great and the architect is the first to point this out. New finishing contractors are now on board for the Learning Centre and the difference when you look inside the completed lecture theatres is marked. There’s also the phasing issue and the way things are done differently in India. The financial imperative meant the students moved in before snagging had happened. Lifts still have large parts of the stainless steel covered in the protective plastic, areas around doors have majorly cracked plasterwork and there’s a host of other faults or incompletions that in a European building would have been sorted way before handover. McCullough Mulvin is confident they will be finished properly eventually. It certainly is — it’s a building in progress that’s also teeming with students. There are parts of the Learning Centre in use, such as the lecture theatres, that in the UK would be considered hard-hat areas. Another ethos exists in India, they do things differently — it’s majestic chaos.